AIDA Cruises is the leader and most recognized cruise brand in the German cruise business. 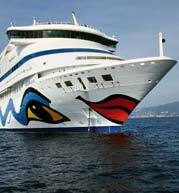 A total of ten AIDA ships are currently in service: AIDAcara, AIDAvita, AIDAaura, AIDAdiva, AIDAbella, AIDAluna, AIDAblu, AIDAsol and AIDAmar, AIDAstella. These vessels currently operate in the Mediterranean, Northern Europe, the Caribbean, the Arabian Gulf and around the Canary Islands. AIDA ships are dedicated to the German-speaking market and renowned for their youthful style and casual service. As a seagoing "club resort," AIDA ships incorporate the successful elements of upmarket clubs and resorts in the premium and four-star range, with a host of on-board amenities and facilities that attract younger, more active, as well as relaxation-seeking vacationers. AIDA Cruises is the largest cruise liner in Germany and is headquartered in Rostock. It is part of the Carnival Group along with other well know brands such as Holland America Line, Cunard Line, Princess Cruises, Seabourn Cruise Line and Costa Cruises. Aida Cruises caters to the market of active and casual cruisers. Its market is predominantly young and fun loving German speaking guests, who enjoy a "club resorts" style of cruising. Its ships sail to many exciting destinations around the world. In the summer, its itinerary includes the Baltic Sea, Mediterranean, North Sea, Canada and New England. Whilst in winter, it heads to the Caribbean, Canary Islands and Middle East. The cruise operator has a fleet of ten ships, with two new ones in the pipeline. Papenberg based shipbuilder Meyer Weft will complete construction of the ships for delivery in spring 2011 and 2012. First cab off the rank is the AIDASol, built in modular fashion and will include a state of the art theatrium for world class performances. Aida has a unique tradition whereby each of its ships is baptized by a special "grandmother" before setting sail on its maiden voyage. It has many "grandmothers" including famous supermodel Heidi Klum, who blessed the AIDAaura prior to its presence at the 2004 Olympics in Athens. The AIDAaura along with the AIDAluna were featured in their full glory at the Hamburg Cruise Days in July of this year. This spectacular event is one of the biggest maritime events in the Northern Hemisphere enjoyed by cruise enthusiasts. As prospective employees will be providing onboard service to cruise holiday makers from Germany, Austria and Switzerland, a command of German would be an advantage. Job opportunities may be found in the areas of entertainment, engineering and technology, hotel and gastronomy, guest services, retail shops, and shore operations.